Astronomer Linda Sinkay embraced her passion for viewing the night sky like so many other young children who went camping with their families and were charmed by the mythology of the constellations, as the State Park Ranger told stories of Andromeda and Perseus, while pointing out their constellations. Make a wish! Linda's love of star-gazing stayed with her and became something to share with her family and friends, as she excitedly convinced them to join her for every meteor shower event, promising them a magnificent show. These memorable meteor shower outings were Linda's first Star Parties, as she made them special by making sure that she had all the creature comforts for those lucky people she could convince to join her. Today, Linda's Astronomy adventures have grown into a passion for Astrophotography. 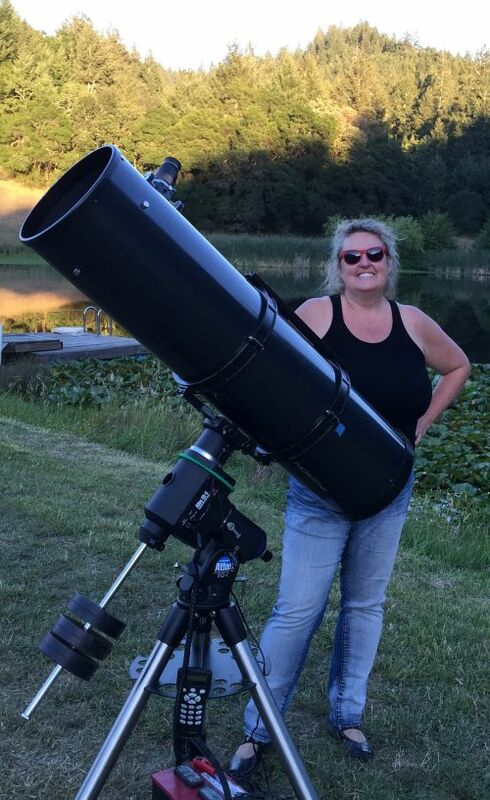 With her 10 inch Orion Atlas Reflector telescope, she takes great joy in capturing her visual experiences of viewing remarkable night sky objects. She is a Docent at the Robert Ferguson Observatory, where she shares her love for astronomy with others. Linda is originally from Chicago, IL, and has lived in Sonoma County since 1988, raising her children and serving her community through her membership in the Rotary Club of Sebastopol Sunrise. As a thank-you gift for her service as president, her fellow Rotary club members gave her the gift of a new telescope and named a star after her. It is her mission to find her star in the night sky someday. When asked why she wanted to offer night sky tours with Wine Country Star Party, Linda said, "When I embrace all the wonders of the night sky, I am inspired, fulfilled, and humbled by the mystery and beauty of our amazing universe. Astronomy and Star Parties make me feel like I am living my best life, experiencing the joy of 'stolen time', time filled with exquisite and memorable experiences. It is like I have this best kept secret of the stars, and I can't wait to share it with you." Jim Goodenough is an Astronomer and Docent at the Robert Ferguson Observatory. He prefers to view Deep Sky Objects such as Star Clusters and Galaxies. However, Jim's first big "WOW" Astronomical experiences were while viewing planets. Jim viewed Saturn setting in the summer sky and waited up until 3:00am to see Jupiter and its 4 Galilean moons for his first time rise in the east. During this first sighting of Jupiter, Jim said out loud, "I am buying my own telescope!" Some of Jim's favorite night sky objects include the Double Cluster, Indian Doll, Bode's "Nebula", Dumbbell Nebula, Albireo, and Saturn. 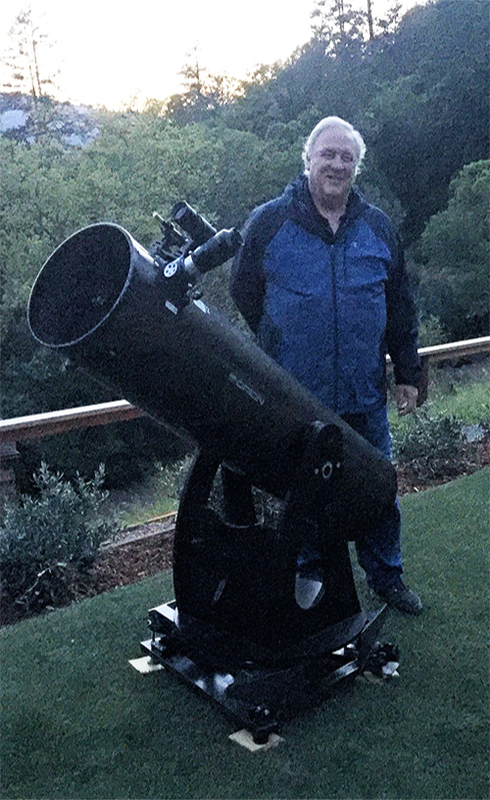 Jim prides himself in finding many obscure night sky objects by memory - often seeking them and locating them without the assistance of a computerized "GoTo" telescope. When Jim discovered his birthday was on the same day as that of 18th century Astronomer William Herschel, he began reading the biographies of early Astronomers. He finds their lives, works, and discoveries fascinating. Jim is a California native and has lived in Sonoma County since 1980. He has BS and MS degrees from the School of Engineering at Stanford University and was President of the Rotary Club of Sebastopol Sunrise in 2006-2007. Jim worked for over 20 years as a Development Engineer at Hewlett Packard and later as a Process Engineering Manager at Agilent Technologies. Jim is the owner of Goodenough Website Services. He designs and produces websites for Businesses, Non-Profits, and Individuals. Jim is currently employed by the Santa Rosa Junior College and works as a Website Specialist in IT.